This topic describes the "Sockets in C++" sample application implementation. This tutorial demonstrates how to use TCP and UDP sockets in a Native Client (NaCl) embed module. 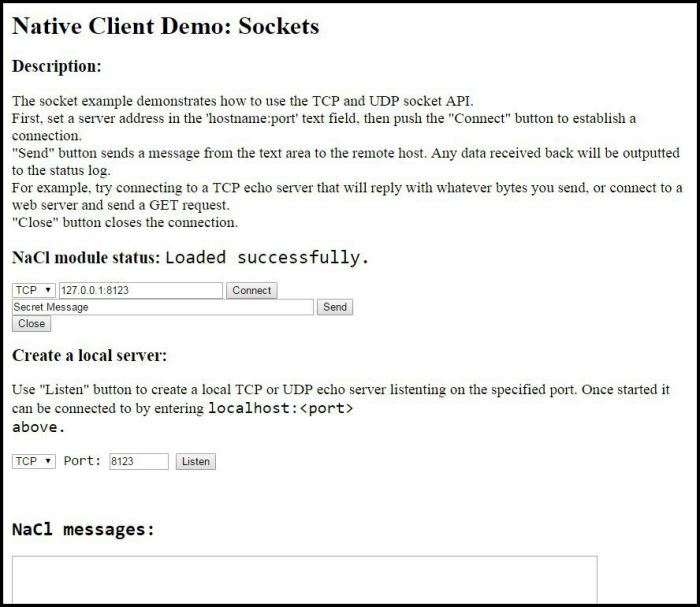 The sample application allows the user to create a basic TCP or UDP server that echoes text messages sent to it. To create the server socket, select the socket type, enter the desired port number, and click "Listen". The socket automatically starts listening for incoming connections. To create a client TCP or UDP socket and connect it to a host, select the socket type, enter the host address and port, and click "Connect". You can connect to the locally-created socket, or to a remote socket. To send a message to the server socket, enter the message in the "Secret Message" field, and click "Send". To close the client connection, click "Close". Although the user interacts with the same application interface for both TCP and UDP sockets, the underlying logic depends on the socket type. Create a client TCP socket and connect to a specified host. Create a client UDP socket and connect to a specified host. Close the client TCP or UDP socket. Listen on a TCP or UDP server socket. Send a message from the client socket to the server. // TCP server for handling incoming connections and sending/receiving messages from them. // receiving/sending messages from/to remote hosts. When initializing the objects, check whether each interface is available. An interface can be unavailable if the required permissions have not been specified in the manifest file, or if the interface is not supported by the platform. When a client connection attempt is detected, trigger a listening callback to accept the connection. In the on_server_accept_callback_ function, which is triggered when a client connection attempt is successful, save the client socket to the incoming_socket_ object and log the IP address the connection was accepted from. Wait for incoming messages on the client socket using the TryRead() function. In the Write() function, write the message to the connected socket, and resume waiting for incoming messages. When the client disconnects, reading fails and the failure message is passed to the on_server_receive_callback_ function. When the client disconnection message is detected, restart listening for connections. The client TCP uses a single pp::TCPSocket object. After the application is initialized, the TCP socket client can connect to the TCP server in the sample application or an external TCP server. In the SimpleTCPClient::Receive() function, attempt to read from the socket. When a server message is received, trigger the SimpleTCPClient::OnReceiveCompletion() function. In the SimpleTCPClient::OnReceiveCompletion() function, trigger the OnTCPClientReceiveCallback() function from the main class. Resume waiting for messages by calling the Receive() function again. Unlike a TCP server, only a single UDP socket is needed for a UDP server. After the server has been bound to a listening port, it can monitor incoming connections and receive messages from multiple sources. Bind the socket to an IP address and port. To send a message, write the message to the socket. Trigger the OnReceiveFromCompletion() function, which invokes the OnUDPClientReceiveFromCallback() function of the SocketInstance class. To resume listening, call the Receive() function. Close the current pp::UDPSocket instance. Reset the socket instance by creating a new one.